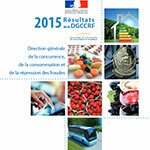 Since the entry into force of the Consumer Affairs Act of 17 March 2014 (the"Hamon Act"), the powers of the General Directorate for Competition, Consumer Affairs and Fraud Control (DGCCRF) have changed considerably. The sanctions and the diversification of the types of investigations that it now has at its disposal were largely used during the year 2015. This is clear from the results for 2015, published on 8 March 2016. A clarification of the key elements that the cosmetics industry must have in mind, by Sylvie Gallage-Alwis (Hogan Lovells), Counsel to the Court. During the year 2015, the DGCCRF reported having carried out 575,200 product checks, controlled 119,200 establishments, 10,450 Internet sites and carried out 294,000 laboratory analyses. With the exception of the number of Internet sites monitored (which was 10,300 in 2014), all these other figures are lower than those for 2014. One might therefore think that the DGCCRF was less active in 2015. That would be a misinterpretation of his balance sheet. It has, in fact, been more repressive. Thus, in 2014, 111,200 violations were recorded against 115,830 in 2015, 10,900 reports were drawn up against 13,897 in 2015, and 12,600 administrative police measures were taken against 17,701 in 2105. New in connection with the Hamon Law, 2,914 transactions were signed and 1,671 administrative fines were imposed, preventing these cases from leading to criminal proceedings.